BIG NIGHT AT BINGO ! ! It was a case of 'good things come in threes' on Saturday 5th January when three very lucky members became the latest to win big at Castle Bingo! 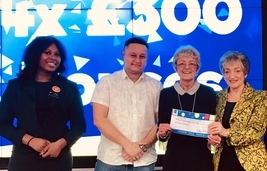 Jean, a regular member from Cardiff, was lucky enough to see her numbers come up on the National Bingo Game, scooping a whopping £50,000 Jackpot prize, as well as the club prize. The whole club began applauding the fabulous win and Jean was in complete shock to learn that the astonishing £50,000 Jackpot was hers to take home. Twenty minutes later at the same club another lucky player, Claire, called house on Castle Bingo's exclusive C45TLE Jackpot winning £22,500, with a third member in Castle Bingo Merthyr also winning £22,500. All three wins were celebrated with parties at the winning clubs, where the lucky winners were each invited up on stage to receive their cheques: plans for the big wins included new cars and a holiday to two. "We are thrilled for out lucky National Bingo Game £50,000 Jackpot Castle Bingo winner and hope that she enjoys her winnings: what a great night of big wins at Castle Bingo!" To find a participating bingo club near you click HERE and to stay up to date with all news and winners you can follow the National Bingo Game on Facebook and Twitter. All players must be aged 18 or over. The National Bingo Game is played under the provisions of The Gambling Act 2015 and played under National Bingo Game Players' Rules. Players should always gamble responsibly. For more information and advice visit www.BeGambleAware.org.